The turbulence experienced by the Eurozone in 2010-12 highlighted the shortcomings of the currency union. This column suggests that the crisis was exacerbated by a combination of a lack of market adjustment mechanisms, rapid financial integration, and underlying design issues. While substantial progress has been made to address some architectural issues, minimal elements of a fiscal union are still needed in our view to increase the union’s resilience to shocks and to prevent the re-emergence of broader economic and financial stress. The 2010-12 Eurozone Crisis highlighted serious shortcomings in the functioning of Europe’s economic and monetary union (Baldwin and Giavazzi 2016). Monetary policy can address common shocks, but country-level shocks have remained important, as shown in Figure 1 (Allard et al. 2013). Left unaddressed, they can spread across the Eurozone as seen during the crisis, following the deep financial and trade links that are the essence of the single market. Moreover, gaps in economic and monetary union architecture actually contributed to the buildup of economic vulnerabilities and amplified the effects of these shocks. European fiscal rules were too loosely implemented to ensure that public finances were managed appropriately across the cycle in member states. Weak fiscal policies in some countries before the crisis left them ill prepared when adverse shocks manifested. Windfalls from lower interest and debt payments were not saved, higher revenues generated by unsustainable domestic demand booms were wrongly deemed permanent, and in some cases, the shocks themselves were the result of idiosyncratic policies (for example, in Greece). Widespread optimism about the region’s growth prospects at the euro’s inception blunted markets’ scrutiny of national fiscal policies and fueled the rapid convergence of sovereign borrowing costs before the crisis. Furthermore, the so-called ‘no bailout’ clause codified in the European treaties was not credible. With few automatic mechanisms in place to support individual members in distress ex ante, markets extrapolated that crises in affected countries and spillovers to others would be deep enough for policymakers to prefer to bail out a member country ex post rather than let it default. In other words, market discipline failed ex ante because the no-bailout option was not ex post credible. Prices and wages displayed strong downward rigidities in many Eurozone countries, standing in the way of the timely real exchange rate adjustment that is necessary in a currency union and contributing to the buildup of external imbalances. Likewise, labour mobility — even though increasing — continued to be lower than in other common currency areas, both because of language and cultural barriers and institutional constraints — such as the inability to port pensions or unemployment benefits across borders — inhibiting rebalancing through migration. Financial integration propagated and amplified spillovers. Once shocks hit, they spread rapidly via banks. With banks coming under stress, attention turned to the weakness of their national sovereigns, raising concerns that they would not be able to support them. Likewise, sovereign stress aggravated the stress on national bank balance sheets, as banks still tended to be more exposed to their local sovereign. Those factors quickly set off a severe negative feedback loop between sovereigns and domestic banks. Note: The idiosyncratic growth shocks are derived as the part of the country-specific growth shocks that are not explained by EZ-wide growth shocks. Growth shocks (both for the euro area and individual countries) are computed as the residuals from a regression of the country's (or euro area's) growth rate over two lags. Sources: Organisation for Economic Cooperation and Development; and IMF staff calculations. By further harmonising the functioning of financial markets, the policies outlined in the Capital Markets Union Action Plan should also help increase the amount of risk sharing provided by the private sector. But it will take some time to implement. Yet given the persistence of sizeable country-specific shocks and their ability to freeze markets, some kind of common insurance mechanism still seems required. With that in mind, there are three broad considerations that lead us to advocate a minimal set of elements of a fiscal union for the Eurozone, which must be complemented by measures to reduce moral hazard and enforce fiscal discipline. First, both market and fiscal risk sharing mechanisms can play key roles in smoothing the economy’s response to shocks, but improving private mechanisms will take some time. Although the Eurozone is not a full political union, its closest institutional comparators are federations, where sovereignty is split between the central and sub-national governments. By contrast, income shocks to Eurozone countries are only about 40% smoothed, with fiscal risk sharing found to be nearly zero. This evidence suggests that the Eurozone’s resilience to shocks could be enhanced with more risk sharing, with a mix of both private and public mechanisms. Sources: Hepp and von Hagen (2012) for Germany; Sorensen and Yosha (1998) for the U.S.; Balli, Basher, and Rosmy (2011) for Canada; and Afonso and Furceri (2008) for the Economic and Monetary Union and the European Union. Second, fiscal risk sharing can be implemented in different ways, but all involve some transfer of resources to the centre which may then be used to respond to shocks. In a study of seven federations (Australia, Belgium, Brazil, Canada, Germany, Switzerland, and the US) at least one-third of general government expenditure is assumed by the center, and half or more of general government revenue is collected by the center (Bornhorst et al. 2013). The central government typically provides insurance against idiosyncratic shocks through two broad channels — first, social protection like unemployment insurance, and second, public capital investment. In the US, the sub-national components play a larger role in social protection, while the federal government provides a floor on benefits. The share of public capital investments accounted for by central government ranges from about 10% in Canada to over 40% in Brazil. With a minimum of fiscal risk sharing in place in these federations, a region facing severe financial distress is not deprived of essential public services, including social security and financial stability, and the social and economic costs of a crisis are contained, reducing the odds that ex post financial support is needed. How large might such transfers need to be? As an illustrative example, we estimate that if the Eurozone had had a common rainy day fund to help smooth shocks since its inception, annual contributions of the order of 1½ to 2½% of GNP would have been sufficient to provide a level of risk sharing comparable to that found in Germany (80% versus 40% for the Eurozone currently). Third, fiscal risk sharing has to come with stronger fiscal discipline. But here too different models exist. 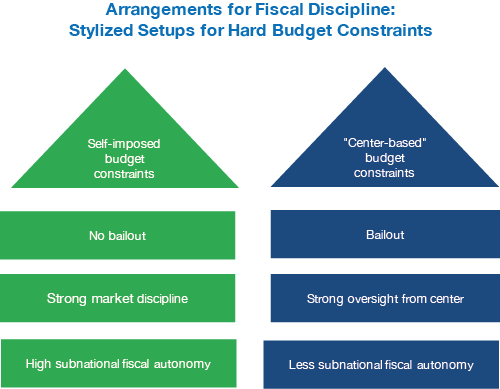 Drawing on the experiences of federations, two stylised models for achieving fiscal discipline and reducing moral hazard emerge (Figure 3): credible no bailout and market discipline of sovereigns; or possible bailouts, but with strict oversight by the centre. For example, on the one hand, subnational entities in the US and Canada are restrained by market discipline underpinned by a credible ‘no bailout’ rule and self-imposed budget constraints. On the other hand, Brazil, and more recently Germany, have models with strong central oversight of subnational budgets imposed after past bailout episodes. The evidence across countries is that the more fiscal risk sharing across sub-national components is provided, the more constraints are placed on sub-national entities’ fiscal decisions (Figure 4). Where does that leave us in the Eurozone? The truth is that, while market discipline can be an important element to prevent future crises from emerging, it cannot be restored quickly — which means that, in the interim (and potentially as a long term solution too), enforcement in the Eurozone will have to be imposed more directly from the centre. Note: France and the United Kingdom are unitary countries, where administrative units are defined by the central government and exercise powers at the central government's discretion. The remaining countries (Australia, Brazil, Canada, Germany, the United States) are federations, where the subnational states' existence and powers cannot be changed unilaterally by the central government. 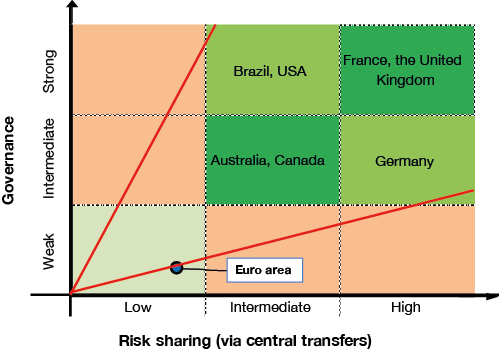 The risk sharing classification is based on estimates from the literature of the share of income shocks to subnational entities that are absorbed by central transfers. The governance classification is based on a review of each country's codified rules and an assessment of their effectiveness in constraining subnational budgets. A common fiscal backstop for Eurozone banks to weaken the links between sovereign and bank risks in a crisis. In addition, some common borrowing will be key to finance greater risk sharing and strengthen backstops while providing a common safe asset. Authors' note: The views herein expressed do not reflect or represent the views of the IMF. Afonso, A and D Furceri (2008), “EMU enlargement, stabilization costs and insurance mechanisms”, Journal of International Money and Finance 27(2): 169-187. Allard, C, P K Brooks, J C Bluedorn, F Bornhorst, K Christopherson, F Ohnsorge, T Poghosyan and an IMF staff team (2013), “Towards a Fiscal Union for the Euro Area”, IMF Staff Discussion Note, 13/09. Andrle, M, J Bluedorn, L Eyraud, T Kinda, P Koeva Brooks, G Schwartz, and A Weber (2015), “Reforming Fiscal Governance in the European Union”, IMF Staff Discussion Note, 15/09. Baldwin, R and F Giavazzi (2016), How to fix Europe’s monetary union: Views of leading economists, VoxEU, ebook, 12 February. Balli, F, S A Basher and J L Rosmy (2012), “Channels of risk-sharing among Canadian provinces: 1961-2006”, Empirical Economics 43(2): 763-787. Bluedorn, J, D Furceri, F Jaumotte, F Ohnsorge, T Poghosyan, and A Zdzienicka (2013), “Fiscal Risk Sharing: New Evidence for the Euro Area”, Technical Background Note to IMF Staff Discussion Note, 13/09. 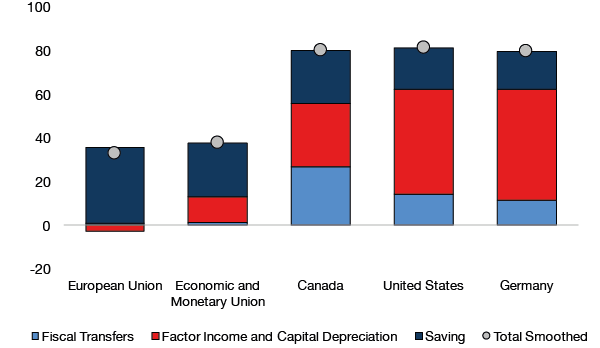 Bornhorst, F, E P Ruiz, and F Ohnsorge (2013), “Fiscal Union: Common Practices in Federal States”, Technical Background Note to IMF Staff Discussion Note, 13/09. Goyal, R, P K Brooks, M Pradhan, T Tressel, G Dell’Ariccia, R Leckow, C Pazarbasioglu and an IMF staff team (2013), “A Banking Union for the Euro Area”, IMF Staff Discussion Note, 13/01. Hepp, R and J von Hagen (2012), “Interstate Risk Sharing in Germany: 1970-2006”, Oxford Economic Papers 65(1): 1—24. Sorenson, B E and O Yosha (1998), “International risk sharing and European monetary unification”, Journal of International Economics 45(2): 211-238. 1 However, the new framework may have become too complex. See Andrle et al. (2015) for an argument and analysis on how the fiscal framework could be simplified. Moreover, fiscal buffers are still very low. 2 See Goyal and others (2013) for an argument that common deposit insurance with a common fiscal backstop is needed. 3 In political federations, sub-national markets for credit and capital have tended to be less segmented, as there has historically been broad access to a larger, national market. By contrast, credit and capital markets in the Eurozone had been largely defined by national borders until recently. Consequently, it may take some time to fully develop private risk sharing across the Eurozone.